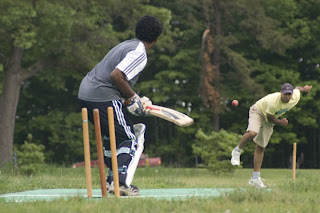 Stella Abraham: Cricket In Vermont!! I saw a fantastic article in the latest Seven Days on the great British pastime of Cricket. It turns out that there's been a Cricket Club in the area for over 25 years! The Chittenden County Cricket Club, or CCCC as they're better know play on the field at Officers Row, near Route 15 at Fort Ethan Allen.